Are you for high quality residential awnings at a cost effective price? Then you’re in luck. Carroll Awning Company makes custom residential awnings from high quality material and offers them to clients at competitive market pricing. Home awnings are perfect home additions when you’re liking for that extra architectural touch. Custom Residential awnings can be installed on doors, windows and above patios or balconies. You can even purchase retractable awnings that can stand on their own. The awnings you select for your home will all be based on your personal preferences and needs. We can get creative with the decor of your awnings by adding in colors you love, patterns and logos into your home design plan. Awnings do not only look stylish but the items are also highly functional all year round. Awnings can provide you shade while protecting you from the weather elements. Residential awnings can save you energy by reducing your home’s overall solar heat gain. We can create you unique patio awnings, window awnings , door awnings and overall retractable awnings. All Carroll Awning Company products come with a warranty plan. This will help you keep up on awning maintenance. To put it simple, we make it easier to kelp your home looking. Appearances mean everything to home value. -Residential awnings like window awnings and door awnings add dimension and color to a home to make it more warm and welcoming. 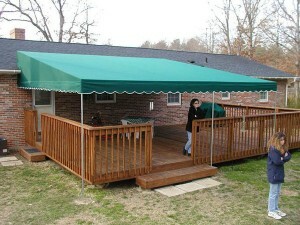 -Awnings increase the outdoor living space. -It protects areas like the patio from inclement weather. -Adds sophistication to roof lines by providing angles. Take a look at our awning photo galleries to see residential awnings and retractable awnings. We are ready to add color, focal points to your residential property today.